The United States began minting dimes all the way back in 1796. These 10-cent pieces have featured a number of changes since then but continue to be minted to this day. So, how much does a dime weigh? Since 1965, all dimes minted in the U.S. weigh 0.080 ounces (2.268 grams). They are made of 91.67% copper and 8.33% nickel. 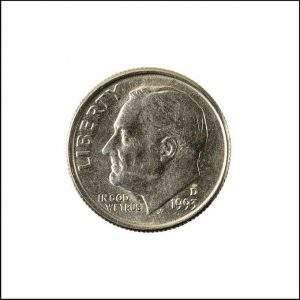 The dime is also the smallest and lightest coin produced. It weighs less than the penny (2.50 grams). According to an old legend, in the early 1900’s a shipment of dimes was headed towards the U.S. Mint in San Francisco when it supposedly fell over a cliff in southern Utah. Over the years there have been a lot of people who tried finding the money. To this date no one has ever found the money or even any evidence of it.